The first habit, the imperative "be proactive" is derived from the fact that Humans can think about thoughts. This self awareness, abstract level of reflection, empowers us so we may overcome some very strong powers that guide us by default. These forces are often considered to determine our life. Experiments with animals showed you can create stimulus-response relationships. This notion is often thought of as a system to influence human behavior with "carrots and sticks" (or MBOs). Having self awareness, imagination, conscience and will - we can choose. We can always choose. Viktor Frankl called that freedom to choose "response-ability". You could have Liberty, but without mastering Responsibility, the ability to choose your response - you do not have true Freedom. Why is it called "Be Proactive?" 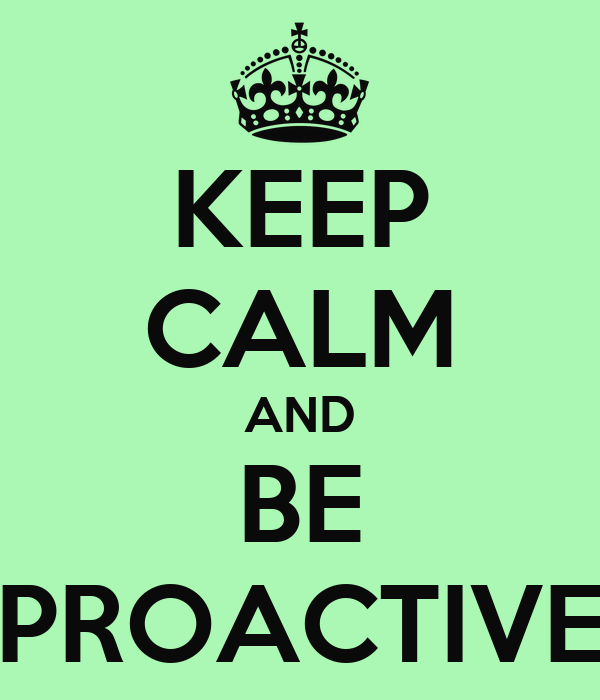 Proactive as opposed to Reactive. Being reactive means you let others drive your emotions and behaviors. Being proactive, you are driven by your own values. You take initiative and don't wait for someone to take care of you. Reactive people often use a victimized language: "have to," "he makes me", "they won't", "it's just the way I am", "that's the way things are"
Covey points out that each of us has a part of the world we are concerned about, and a part we can influence. Proactive people focus their energy in their circle of influence, and by doing that they increase their influence over time. Wasting energy on the part we're concerned about but can't influence is likely to be less effective and mostly filled with complaint, blame and negative energy, which in turn shrink the circle of influence with time. The problems we encounter are either under our direct control (our own behavior), our indirect control (other people's behavior) or we might have no control over them (such as the past). The solution to the problems over which we have any control lies with practicing the habits, while wholeheartedly accepting those outside our circle of influence. We might not be able to choose the reality, but we are able to choose our response and reaction to it. Covey suggests some things you can do to practice the first habit. Focus on being - when you complain about another you aren't influencing anything for the better. The only thing you control is your own behavior. All I posted related to responsibility.